Nepal, a fascinating Himalayan Kingdom, occupies the largest part of the youngest mountain range on earth. The towering Himalayan range extends 800 km across the length of the country from East to West, with eight peaks rising above 8000m. From North to South, within the average of 200 km width, the landscape of the country changes from snow-capped mountains - highest among them Mt. Everest 8848 m - to the flats of Terai plains, less than 100m above sea-level.. The contrast in the landscape has given rise to climatic variation and bio-diversity making Nepal an enchanting destination, offering many opportunities for experiencing mesmerizing grandeur of the Himalayas in the North and subtropical vegetation profuse with exotic wildlife in the South. The middle part contains valleys strewn with towns portraying ancient history, culture, art & architecture. Location: Nepal lies between 80 4 ' and 88 12 ' East longitude and 2622 ' and 30 27 ' North latitude. The bordering countries are Tibet towards the North and India towards the East, West and South. Size: Nepal covers 147,181 square kilometers of Earth. Time: Nepal is 5 hours 40 minutes ahead of Greenwich Mean Time. Although Nepal is a relatively small country, it encompasses a wide variety of environments, people and culture. The country can be roughly divided into three geophysical regions, each with its own unique ecosystem and way of life. The southernmost plains of the country extending from East to West are known as the Terai. The alluvial soil here deposited during the Himalayan formation is highly rich and deep. 2. The Chure: The range of hills in the southern part of the country is known as the Chure or Siwalik. Its formation took place in the fourth phase- the last in the process of Himalayan Orogeny. 3. The Bhitri Madhesh: The Bhitri Madhesh or the Inner Terai exhibits similar topographic characteristics of the Terai and lies in between the Chure and the Mahabharat Lekh. 4. The Mahabharat Lekh: Mahabharat Lekh consists of a range of hills extending from Mahakali to Mechi River covering the length of the country. The altitude of the hills in this range differs from 1500m-3500m. 5. The Midland Region: The area in between the mighty Himalayas and the Mahabharat Lekh is known as the midland region, the Pahad. It consists of small hills, innumerable valleys, rivers and gorges. Within the average breadth of 50 km to 100 km the elevation of the landscape here varies from 600m to 3000m. Katmandu valley and Pokhara valley lie in this region. The Himalayan Range, the world's youngest and highest mountain chain, curves in a great arc from Pakistan through India, Nepal and Tibet. Its formation occurred approximately 25 million years ago from the collision between the main Asian continent and the Indian sub-continent. Nepal contains a full third of the Himalayas, an 800-km long stretch of tremendous peaks. Of the world's 14 mountains, over 8000m eight are in Nepal - Everest, Kangchenjunga, Lhotse, Makalu, Cho Oyu, Dhaulagiri, Manaslu and Annapurna, and 1310 Himalayan peaks. The Himalayas form the Northern border in the Eastern part of the country and from the central part of Nepal it extends West until Mahakali. 7. The Inner Himalayan Valleys: The valleys towards the North of the Himalayas are known as the Inner Himalayan Valleys, the Bhot. Here some of the highlanders live above 4000m. Being in the rain shadow the area is dry. 8. The Trans-Himalayas: Trans-Himalayas encompass some parts of Tibetan plateau lying West of Ganesh Himal. Nepal has a temperate climate, with seasons typical of the Northern Hemisphere. Variation in altitude creates distinct impact on climate. Weather is ruled by the monsoon, which sweeps up every summer from the Bay of Bengal and turns mid-June to mid-September soggy and humid. The monsoon disappears with a final burst in mid-September. By the second week of October the skies are generally clear, with pleasant mild days, cool nights, and fabulous clear mountain views. Depending on altitude, daytime temperatures might reach 25-30 deg C, while nights can drop to -10 deg C. The weather becomes increasingly cooler through November. The season is Autumn. December to February is the winter season, generally clear and dry, with little snow at higher altitudes. Although an occasional storm might bring snow as low as 2500 m. sunny days can be quite warm (20 deg C at lower altitude), but nights can be frigid (0 deg C or as low as -15 deg C at higher altitude). By March, the weather shifts to warmer and wetter spring conditions. Mornings are usually clear whereas afternoons are marked with occasional rainstorms. The air is hazier than in the fall. Daytime temperatures increase quickly in March with temperatures of rising up to 30 deg C followed by mild nights. By late April-May, it is distinctly hot in lower regions. At higher altitudes it is still cool during the day and at night temperatures can drop below 0 deg C. The increase in rainfall in the hills is more than compensated by the spectacular displays of rhododendrons at this time of year. 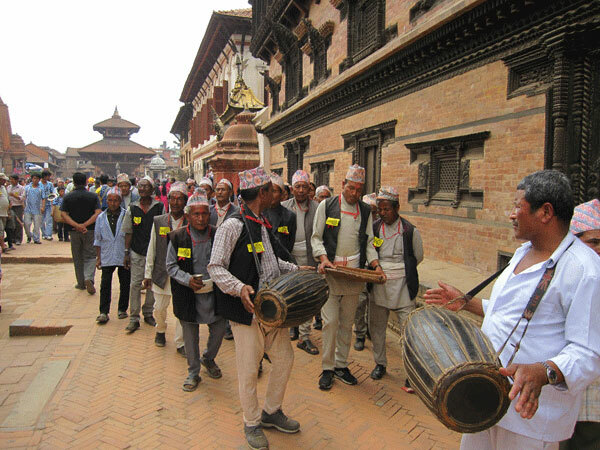 There are over 36 ethnic groups in Nepal, each with different language and distinct way of life. Often, while traveling from one area to the one enters a new cultural region. The people, their dwellings, way of life and attitude are very different. The people who live in the high mountains in the North are mainly of Tibetan stock and are Buddhists. The people who live on the flat plains of Terai exhibit Indian like lifestyle and mostly are Hindus. In the hills and valleys of the mid-country, a fascinating blend of two extremities can be observed and the dwellers are known as Pahadis. Nepali, is the national language, thus the official language as well. Although there are over 36 different ethnic groups in Nepal each with own individual dialect, between them they normally communicate in Nepali. Hinduism is the major religion practiced in the country. Lord Sakyamuni Buddha, the enlightened one was born here. After Hinduism Buddhism as philosophy and religion has great impact upon the people of the country. Jainism, Christianity, Islam are also practiced. The unique feature among the people is that the Hindus and the Buddhists have been living in harmony for centuries and still is. Among the Newars of Katmandu valley distinct practitioners of Hinduism and Buddhism are evident. Despite this fact, they live in harmony and most of the time observes one another's culture, which makes them look like one.